You have heard of potato wedges, this is a similar recipe, with just slices. It's an easy recipe usually to satisfy the craving of a potato chip. Ah and this is a recipe by my MIL :). 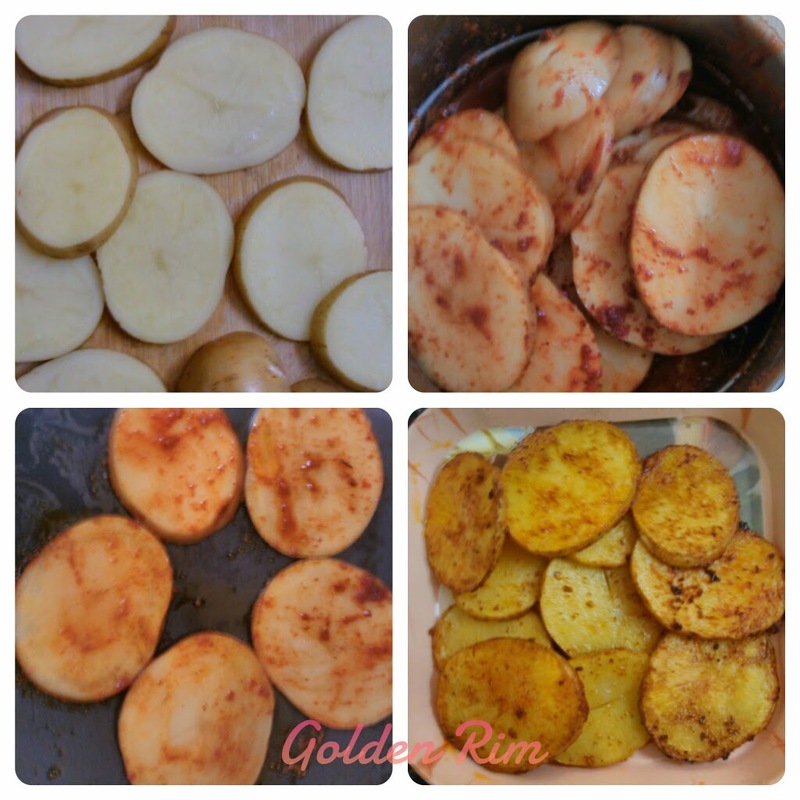 I love this recipe and prepare it whenever I feel like having potato. 1) Wash the potatoes thoroughly well. Do not peel the skin of the potatoes. 2) Cut them into slices. They should be mediumely sliced. 3) Put them in a pan, add chilli powder and salt according to taste. 4) Add a little bit of water to make sure that the slices are well covered with chilli powder. Keep aside for a few minutes. 5) Put liberal amount of cooking oil on a tava or frying pan on a medium flame. Put around 3 to 4 slices on pan or tava. Cover with a lid. 6) Let the potato slices steam on medium or low flame. Check whether the slices are steamed and toss up and steam the other side of the slices. Repeat for all the slices :). 7) Take off the flame and garnish with lemon juice. That is it, your dish is ready to eat. To check whether the slices have steamed or not put a knife through the slice. If it goes through easily they are cooked. Do try and tell me in the comments section below. Do you know any recipe with potato? Share it with me on Twitter, Facebook, Google+ and Instagram.